You don’t have to be a musical genius to join us. Believe it or not, many choir members have no formal music training and most do not read music. The only requirements are for you to be able to sing in tune and show a commitment to the choir concerts and rehearsals. In return you can be certain of a friendly reception, a common interest in good music of all types, a great deal of fun and humour and trips to prestigious venues such as The Royal Albert Hall, The Sage Gateshead, The Usher Hall in Edinburgh and Durham Cathedral as well as the possibilities of visits to other Choirs both home and abroad, (we still maintain our links with a German Choir begun as part of the town-twinning initiative). The aim of the Musical Director, supported by the Committee, is to maintain the Choir strength at or around the 80 mark. So we are always on the look out for men who may want to join. If you have a burning ambition, think you fit the bill or even if you are just mildly interested, come along to our rehearsal nights. 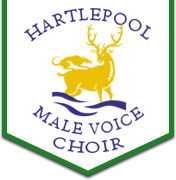 We rehearse in the Corner Flag, Hartlepool Football Club Supporters Association, nearly every Friday evening 7.30 – 9.30 and from the first Monday in October until the Christmas Concert. Why not come along?. Email us or ring Mick Waller 01429 423063, Duncan Graham 01429 296945 and we will be happy to meet you.